Welcome to the Talon Mailing & Marketing September 2016 Newsletter. Sending direct mail or emails can be an effective way to increase name recognition, produce inquiries and attract new clients. 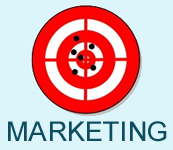 As is the case with any marketing, though, your degree of success can depend on a lot of variables. Let’s face it: People do not like to receive anything that bears a resemblance to so-called junk mail or any kind of sales pitch. If the return address on your envelope identifies it as coming from a real estate company or agent, then many of your prospecting letters will never see the light of day. What triggers people’s interest is being offered something of value, such as a free gift or a service that directly addresses their needs or problems. However, if they don’t even open the envelope or read the first few lines of your letter, then your direct mail campaign will have fallen flat. As a side note: If you’re distributing your message via email, then the main hurdle is writing an enticing subject line — one that either arouses curiosity or speaks directly to the needs and desires of your target group. Some agencies, businesses and organizations make it a point to print a return address on the envelope that does not include the name of the business. That’s one way to avoid being immediately screened out. Individual agents might sometimes put their name and mailing address in the upper left-hand corner of the envelope without making reference to their agency or their real estate credentials. Although all that information would be included in the prospecting letter itself, having it emblazoned on the outside of the envelope can cause people to prejudge and dismiss the contents before they even look at it. Give people a specific reason to open the envelope. Enclosing a free calendar, a packet of garden seeds, a special-edition newsletter or an invitation to a free workshop for first-time homebuyers are a few cost-effective ideas to prompt more potential clients to look inside. Printing or stamping a blurb on the envelope about the enclosure could also serve as an attention-catching device. There are a lot of ways to use your marketing letters to engage your prospects, such as starting out with a question, a thought-proving statement or a compelling statistic. Letters that contain one or more calls to action, a P.S. at the end and a well-organized series of selling points will tend to produce a greater response than generic, cluttered-looking form letters. Include calls to action, a P.S. and well-organized selling points in your direct mail marketing. In marketing, credibility, top-of-mind awareness and developing a reputation for outstanding service are among the factors that separate top producers from the rest of the competition. Although no single tactic is likely to have a transformative effect on your sales success, a series of distinctive real estate prospecting letters via direct mail can be a key element in a well-executed marketing plan. If you believe wall calendars are outdated because of the internet and smart phones, you're missing out on a golden opportunity to grow sales. Ask the people in your organization who are responsible for sales: They face a huge hurdle getting clients and prospects to meet them face-to-face. Many clients and prospects are busy and don't have time for additional meetings - and worse, they're constantly inundated with the same requests from organizations just like yours. Who can blame them for avoiding another meeting request? You probably feel that if your team could get in the door, the chances of securing a new client, or additional business from existing ones, dramatically increases. With that in mind, Talon developed a personalized calendar to help organizations gain access to their clients and prospects. Your organization's calendar will contain 13 pages that can be completely designed and customized by your staff or Talon. A personalized letter and message will appear on the cover and so will a sneak-peak at some great personalized photographs contained inside the calendar. The outside graphics and words will quickly grab their attention and they'll immediately see a summary of the personalized pictures with their name on every picture. 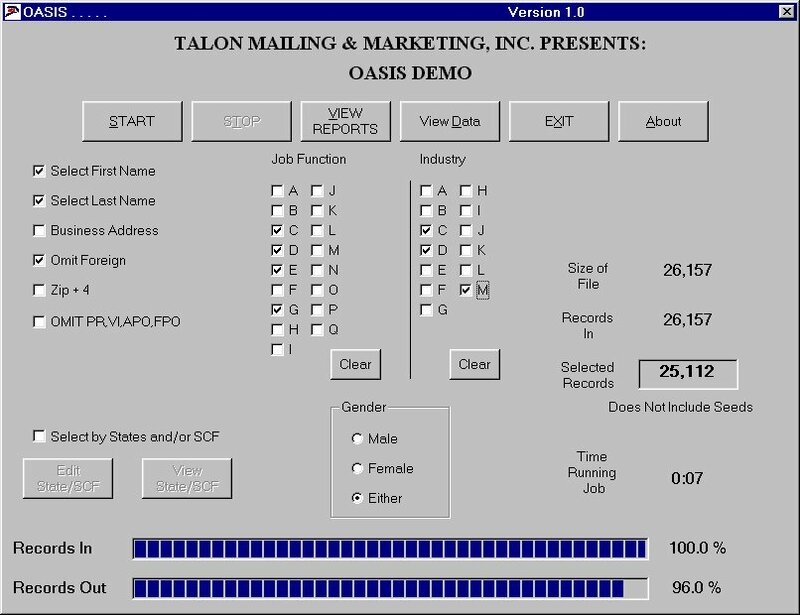 Your organization's name and the services you provide can be on every page, and Talon's name will not appear anywhere inside the calendar. Your custom messages can appear in some or all of the pictures, and the name of your company (or the recipient's company) can be placed anywhere you like. Just send us an Excel spread sheet with your recipient's name (and company if you wish to use that in your designs) and we'll create and produce the calendars. Arm your sales team with a script and watch them obtain many more face-to-face meetings. A script might sound something like this...."Hello, Mr. Smith, this is Larry from the ABC Company. I have a little surprise for you and I was hoping I could drop by your office and personally drop it off. What date and time is good for you?" If your team is having trouble getting past the gate keeper, the above script work wonders - just tell the gatekeeper you have a surprise for Mr. Smith and would like to drop it off in person. If Mr. Smith or the gatekeeper is non committal in setting up an appointment, remind them that you "are only going to take a minute or two" (and trust me, 95% percent of the time, Mr. Smith will meet with you a lot longer than two minutes). If they are still noncommittal or not sure when a good time is, try this: "Mr. Smith, I realize you are very busy, and I want to be respectful of your time... How about we get out our schedules and see when's a good time and date for a quick few minutes?... I will work around your schedule." I promise that these techniques will work more often than not, and the calendar, irregardless of whether it's ultimately displayed, will get your team in the door to promote your services. And if the calendar is placed on the wall or bulletin board, that means your message and company are continually in your recipient's sight for the next 12 months! Looking for a way to increase profits and grow business? 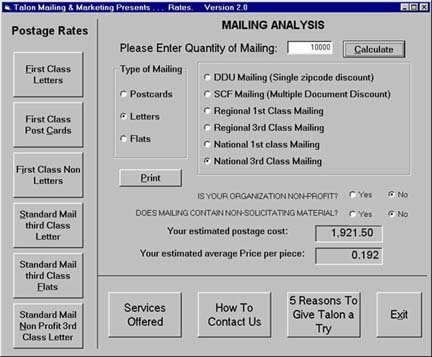 Why not call Talon to discuss how a custom designed calendar will help your business grow. What’s the point of using postal mail in a digitalized, globalized world? This is a pertinent question for B2B marketers. But, in fact, the answer is quite a lot. Despite the dominance of email – in 2015, there were over 205 billion business emails sent and received every day across the world (The Radicati Group) – B2B direct mail still remains relevant. In this article, we will consider four reasons why this marketing medium can still pack a punch. In an age where people’s inboxes are overflowing, a piece of carefully-targeted direct mail can capture their attention. An aesthetically pleasing and clearly branded letter can provide a welcome change from an email. And once you’ve piqued someone’s interest, they’re far more likely to engage with your message. You could also take things a step further by sending a piece of lumpy mail. Whether it’s a box, balloons or food, lumpy mail captures the recipient’s attention and helps to make your campaign memorable. However, it’s important that your message still comes across – a promotional gimmick won’t be enough on its own. There’s a lot to be said for holding a tangible letter in your hands that’s addressed to you – and, given how easy it is for businesses to send out emails, a direct mail campaign suggests that you’ve gone the extra mile to connect with your audience. And you don’t just have to stop at using people’s first name. Just as you would with email, you can segment your mailing list to ensure that different groups of people get the most appropriate content for them – whether that’s based on their job title or industry sector. Choosing direct mail as your B2B marketing medium doesn’t mean you have to abandon technology altogether – in fact, it can be successfully integrated with other channels. Finding the right “marketing mix” is an essential element of building business relationships with the right people. Using direct mail in tandem with a combination of email, telemarketing, and social media can prove highly effective. You might include your social media contact details in a piece of direct mail, for example, or add PURLs (personalized URLs) to your letters. The latter enables recipients to respond to your direct mail marketing message via a personalized landing page – once there, they can access further useful content, such as blog posts and eBooks. Furthermore, in a study carried out by the DMA and fast.MAP, it was found that direct mail is twice as likely to engender trust as email – thereby, increasing the likelihood of a response. Clearly, B2B direct mail is still a powerful tool in your marketing toolbox. With its stand-out nature, propensity for personalization, ability to be combined with other marketing channels – and a good response rate, to boot – direct mail still has a lot to recommend it. Thursday September 8th, 2016. Yankees vs. Rays 7:05 PM. This Personalized Calendar Will Help Grow Your Business. pexels.com - Best free stock photos in one place. polymail.io - A free and powerful platform for email productivity in a beautiful native app — on desktop and mobile. illustrio.com - An extensive library of images you can customize with your own colors, text and figures. dailywatercooler.com - A free and delightful daily email newsletter. cofounderslab.com - Find a co-founder for your startup business in any industry and in any city. chartsme.com - A series of 27 non-political questions that will determine where you fall on the liberal-conservative spectrum. laugh.ly - Listen to the world's largest library of stand up comedy for free.